Turner Broadcasting confirmed on Monday that it is acquiring the sports-blogging network Bleacher Report for what some estimate to be about $175 million — a deal that was first reported by All Things Digital — to help the Time Warner unit bulk up its sports coverage. Although it is sometimes seen as a second cousin to its competitor SB Nation (now known as Vox Media), the acquisition of Bleacher Report is still a fairly significant milestone in the evolution of user-generated content, and a sign that even sites that have been criticized in the past for being “content farms” can evolve to the point where they attract the interest of mainstream media entities. As my paidContent colleague Jeff Roberts has reported, the deal has reportedly been in the works for some time, with rumors of a match-up between Turner and Bleacher Report circulating earlier this year. While the $175-million acquisition may not be as much as the startup’s venture backers were hoping for — since it has raised over $40 million in several rounds of financing — it’s still a healthy figure for a site with an estimated 10 million monthly unique visitors. The purchase of Bleacher Report fills a nice hole for Turner: as Peter Kafka at All Things Digital explained in an earlier analysis of the potential fit between the two, the Time Warner subsidiary lost control of the Sports Illustrated and Golf.com websites earlier this year to another TW unit, and that meant a substantial loss of traffic — and the advertising that goes with it. Coincidentally enough, Bleacher Report has almost exactly the same number of monthly unique visitors as Sports Illustrated. 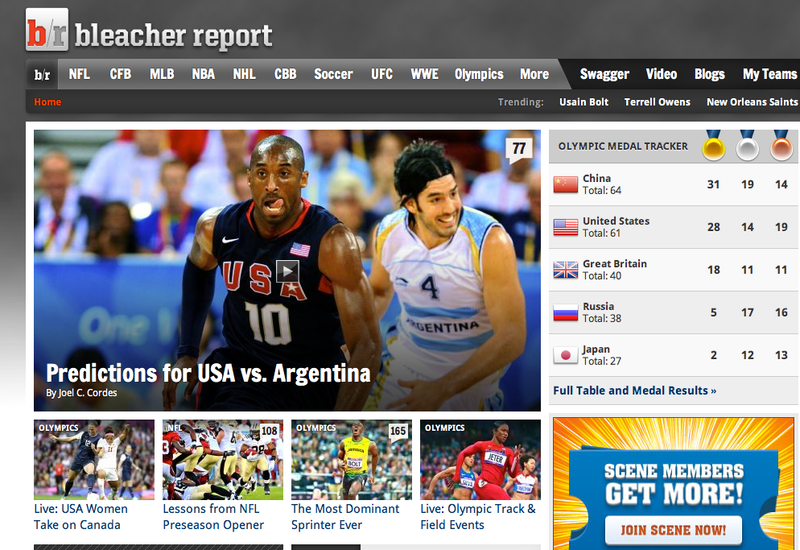 For Bleacher Report, the deal is a validation of the company’s user-generated content model, which some have criticized in the past as being one step away from a “content farm,” churning out aggregated or thinly-sourced content with as much search-engine optimization as possible in order to boost pageviews. Not that long ago, Bleacher Report was seen as a lower-quality version of SB Nation, which some argue takes a more professional approach to the generation of sports content focused around specific teams. This is the same kind of criticism that was lobbed at The Huffington Post (s aol) in its early days, before AOL acquired the company for $315 million and made it the centerpiece of the former portal’s digital-content strategy, and the same charge that has been levelled against BuzzFeed (which was founded by some early HuffPo backers such as Jonah Peretti and Ken Lerer), and at former Wall Street analyst Henry Blodget’s Business Insider empire. All have been accused of “over aggregation” to drive pageviews, or juicing their numbers by making use of other people’s content, or thinly-disguised traffic boosters like slideshows. But like some or all of those other outlets, Bleacher Report has made a concerted effort over the past year or so to bring the quality level of its content up to a higher standard: among other things, the network hired professional sportswriter King Kaufman, and invested a lot of time and energy in efforts such as Bleacher Report University, where young writers were coached in how to produce professional-level content. BuzzFeed has also been moving to broaden its appeal from just funny cat photos or internet “memes” to covering significant political and cultural issues, with the hiring of staffers such as Ben Smith, formerly of the political news site Politico. And The Huffington Post has been bulking up — and arguably raising the quality level of its content — with writers and editors from the New York Times and Wall Street Journal for some time now. Even one of the earliest sites to get the “content farm” label, Demand Media (s dmnd), has been trying hard over the past year to ensure that it has higher-quality content as opposed to just SEO-driven spam. In part, these kinds of moves have probably been driven by Google’s crackdown on SEO gaming by content companies, which it has penalized with successive updates to its algorithms. But Demand and Huffington Post and others have also likely been forced to do so by the knowledge that the pageview-driven advertising game is an increasingly harsh mistress, since the value of that kind of content had been dropping steadily even before Google devalued it. With better-quality content, there is at least the potential to appeal to higher-value advertisers. But more importantly, what Bleacher Report’s acquisition shows is that the model of user-generated content that it and others such as Forbes magazine and Vox and Seeking Alpha have pursued — in which non-professional writers emerge from a community and eventually become subject-matter experts for a specific market — can be an increasingly valuable alternative to the traditional media. Some smart media players like Time Warner will choose to take advantage of that evolution, and others will wind up being disrupted. Does it make a buck? Is the future going to be all ad supported or subscription or dime-a-story? First provider to make dime-a-story technically feasible will not only get rich in REAL dollars, but change the whole (pardon the pun) ball-game! I wonder how profitable these SEO-heavy networks will be in the long run, if Google ever tweaks the algorithm to keep them out. For example, I search for Michael Phelps, and my top result is a Bleacher Report post from last week, predicting how he’s going to do in the Olympics. That’s not useful in the least to me, but there’s something about the wording, or the URL that sends it atop Google’s results. Bleacher Report is a content farm, no qualifiers needed. But it’s one of the best at doing what they’re designed to do, even if that’s not reporting/writing well/being able to spell. Who said it? “First it will be ridiculed, then attacked”, finally accepted…….. if it is true” . The suffix was by Kylneth talking about truth. What is interesting is the sheer pace of communications evolution and strangely, although no real fan, I think it is only Google that is slowing down the repetitive crap flow. Over time, it will be case of “who had it first?”, that will drive the seekers and eventually, it will narrow down to tight zones of expertise and factual (not opinion) content. how come no one is talking about the multiple rounds of VC funding they’ve had over the years? They do generate revenue, but do they generate profits? No matter what, they are gaming google news right now by inserting high traffic key words that have nothing to do with the topic of the article. I challenge you all to do your research on them. It may lack that sheen, but premium pricing can certainly be applied to this model. Seeking Alpha has been selling mostly premium (from its own sales force) for years. Depending only on UGC to drive advertising would be limiting till the community experts become media figures themselves by bringing in enough traffic for making the site attractive enough for advertisers. Its a two edged sword. It also underscroes the importance of specialization in content creation – the net allows and demands deeper analysis, with mutltiple links to similar or back up content, embedded videos etc. Online journalists have to be intrinsically far far more thorough and armed with far more research and knowledge than their offline colleagues. Interesting wrinkle here is that Turner’s digital ad sales are run by Walker Jacobs, who has staked out a career for himself by arguing vociferously against using ad networks, because he says they weaken premium publishers’ ability to maintain premium pricing. Now he’ll be selling inventory that doesn’t come with any of the “premium” sheen that SI.com and Golf.com provided. Hmmm — that is a pretty interesting wrinkle. I guess he will have his work cut out for him then :-) thanks for the comment, Peter. What ever will they aggregate? I do not look forward to a life of vertical iPhone clips of baby animals in place of HD aerial photography of entire ecosystems. Mathew, nice piece. Isn’t this also a statement about the need for web media properties to produce content at much lower cost in order to have a profitable model? User-generated content is a mechanism to not just widen the voices of a community, but also a way to dramatically lower the cost to product content. I presume BR’s effective costs of content are one-tenth that of SI.com or other “professional” media properties. And web economics just don’t allow for that. That’s a great point, David — I think that is one of the biggest disruptive effects of that model, whether it’s Bleacher Report or Forbes or HuffPo, and that’s likely one of the reasons Time Warner was happy to have Bleacher Report take SI’s place.